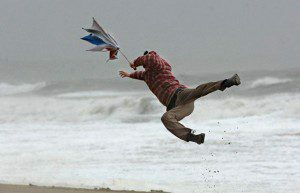 If you live in a coastal area or mountain region, you have to make sure your house is designed for handling high winds. You likely have more experience with big wind gusts than someone living in a quiet little valley (except for those screamers that whip down the valley from time to time). The point is that wind is different wherever you go and building codes reflect those differences. Some areas in the United States, like Florida, Texas, and other Southern Coastal states, have to design their homes to withstand hurricane force winds while areas in Tornado Alley have to build their homes to handle twisters. This morning I was looking through the internet in search of facts about straw bale construction and high winds and I was shocked to see that the hard data is far and few in between. This seems to be an area in which some studies have been done, with promising results, yet little follow up and publications exist. I hope that I am wrong with this assessment and that, in fact, there are studies and papers out there that I am missing. To that end, if you have any leads I should follow up on or if you know of specific resources in regards to high wind/straw bale studies, please let me know. The following is what I was able to discover and, like I said, it is very promising. Several years ago wind tests were performed on a straw bale wall in a wind tunnel similar to that described on the Nordic Wind Tunnel website. The test placed the equivalent of a 75 mile per hour gale force wind on the wall. In order to pass the test, the subject wall was not allowed to move more than 3/8″ from its original position. In the initial testing, the wall passed and, in fact, it did not move at all. The test crew increased the wind load up to a gale force wind of 100 mph. Even with the increase in speed and force, the straw bale wall performed really well, moving only 1/16″, far below the limits provided for in the test. In Serious Straw Bale, a book by Paul Lacinski and Michel Bergeron published in 2000, reference is made to a study performed in conjunction with the Canadian Mortgage and Housing Corporation (CMHC) in which hurricane force wind loads were applied to a test straw bale wall panel. The findings suggest that straw bale walls are vastly superior to conventional walls in resisting wind loads. The results showed that the panel withstood wind loads of 153 pounds per square foot (psf). This means that the straw bale panel could be rated at more than seven times a standard hurricane design load. That’s impressive! As amazing as this all sounds, I think we need more. I would like to see more research done on the strength of straw bale walls and their ability to withstand high winds. We are seeing bigger hurricanes, more often here in the United States, and no one would likely deny that the same is true for tornadoes. We may be sitting on a building technique that can protect thousands of people from the forces of nature and yet we are not in a position to take that technique to those who need to hear about it because we don’t have the scientific testing to back up our claims. It doesn’t matter how amazing these structures appear to be. We need to know without a doubt that they are as great as we believe and the only way to convince the “powers that be” in the construction world is through independent testing. I offer you a call to action. Are you in a place to take part in that testing? Are you a professor or someone else with access to a wind tunnel? Do you have grant writing skills and/or the desire to headline this effort? There are so many things I want to do to increase the popularity of straw bale construction around the world, but I realize I just don’t have the time or ability to do them all. That’s why I’m asking for your help. If we can get the right people together and the right resources lined up, we can make this happen. It’s possible that the results of our efforts will help save lives in the future. While I was doing some research on straw bale homes here in Nebraska I found an interesting story of some farmers in western Ne who had a straw bale home. Sitting around the table playing cards and never heard the tornado outside. A testimony to sound and strength. This was the clincher for me. We are now located in central Nebraska and plan on building a Straw bale home. Well, this is more anecdotal than specific, but the EF5 tornado that hit Joplin, Missouri on May 22 came over the strawbale addition we’re putting on our farmhouse in Stotts City. The first floor loadbearing strawbale walls (not complete) help up with no real problems at all. The frame walls that were underway in the second (1/2) story were struck with a 2*6*8 that was picked up and accelerated quickly enough to knock the centerline frame wall flat from it’s braces. Needless to say, the first floor is where we’re going to locate our storm shelter until our basement’s done . . . . . Seems to me that straw bale walls are good at withstanding wind, but the roof will fly away, especially with the big overhang that the wind will get under. Any reports of how actual buildings and their roofs have withstood high wind? Andrew: As there are many straw bale homes in the area of Nebraska and Iowa, why not follow up on the structures that have been there for 50, 75 or 100 years and if there have been any tornadoes or hurricanes that have gone through this area and if any damage has been documented on these homes that have stood for many years, many more than most conventional homes. Also, Out on Bale, which I am sure you have heard of, which is a Straw Bale Assolciation out of Arizona, may have more information. I hope this is helpful. They also do a newsletter and you should be able to find them on line. Good point. Most jurisdictions have strict code requirements for roof attachments and that would not change with straw bale structures. I do wonder if the extra overhang would require additional bracing per code though. Thanks for the personal input and story. Very helpful and I’m glad you’re okay!! !